Tenohira no Netsu o began in Weekly Shonen Magazine #10 by Eiichi Kitano. Your everyday soon-to-be junior high school student, Kinoshita Shinya, is only on a family visit when he gets lost. Your everyday karate kid, Yanagiya Takumi, is only going on a run when he runs into Shinya. When being lost and training diligently brings new encounters, a new friendship is born! Follow this amazing new series about Karate that is sure to excite! This series is a delight to see. 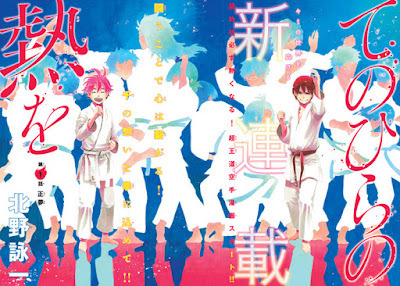 Although it revolves around Karate there is a good amount of comedy and light spirit that makes Tenohira no Netsu o a fun read.